I have always been interested in science, design, art, and the changes they make in our society. Recently I have been focusing on virtual and augmented reality research, but my experience includes computer graphics, robotics, 3d interaction, digital games and interactive art. I received a PhD in Human Computer Interaction from Virginia Tech. My advisor was Dr. Doug Bowman. My dissertation focused on mobile augmented reality interfaces. I have received my MS from the Department of Computer Science of UFMG under supervision of Prof. Dorgival Guedes. In my thesis I investigated an efficient way to render multiple points of view in a computer cluster. I was also an Assistant Professor at the School of Fine Arts of UFMG, Brazil, where I have helped to develop the curriculum of the bachelor's degree in Animated Cinema and Digital Arts. Most of the art installations I have contributed, were part of inaugural or permanent exhibitions in Brazil. Two have been shown abroad so far: the interactive installation "Palavrador Openbook 2.0" which was invited to the SIGGRAPH 2007 Art Gallery, and the installation "Better Hands" which was shown in the ArtScience museum of Singapore. In 2006 I founded a game studio to develop games and other interactive applications in Brazil. I was instrumental in several areas but mostly writing research proposals to funding agencies, managing projects, doing strategic planning, and game design. We ran for almost 10 years, won several major R&D grants, and received an investment from a local venture capital fund. 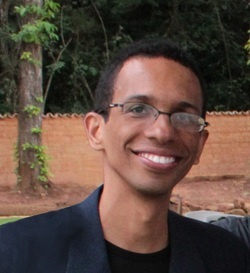 Since 2008 I have been part of the Program Committee of the Brazilian Symposium on Computer Games and Digital Entertainment (SBGAMES). I have also helped bringing the VII edition to Belo Horizonte. In 2009 I have had the opportunity to represent the Brazilian developer community, as Vice President for Institutional Relations of the Brazilian Game Developer Association. I like to go camping, hiking or mountain biking and I like to build things. I do think computers are bikes for the mind .